Wat is dit voor site? Wij zoeken de goedkoopste boeken op internet. Linear Operators and Approximation / Lineare Operatoren und Approximationvonden we het goedkoopst op Bol.com voor €91.99. We hebben gezocht in nieuwe en tweedehands boeken. Rechtsonderaan de pagina kan je het boek direct bestellen	via Bol	.com. 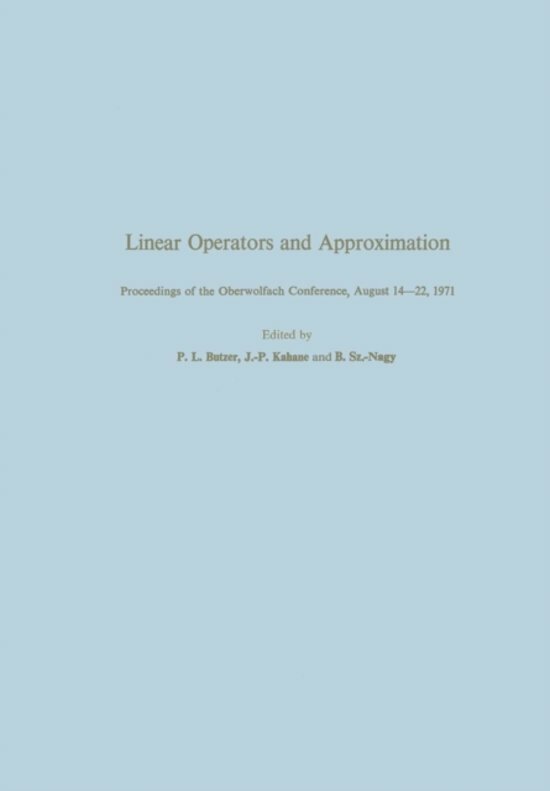 These proceedings contain the lectures presented at the Conference on Linear Operators and Approximation held at the Oberwolfach Mathematical Research In- stitute, August 14-22, 1971. There were thirty-eight such lectures while four addi- tional papers, subsequently submitted in writing, are also included in this volume. Two of the three lectures presented by Russian mathematicians are rendered in English, the third in Russian. Furthermore, there is areport on new and unsolved problems based upon special problem sessions, with later communications from the participants. In fact, two of the papers inc1uded are devoted to solutions of some of the problems posed. The papers have been classified according to subject matter into five chapters, but it needs little emphasis that such thematic groupings are necessarily somewhat arbitrary. Thus Chapter I on Operator Theory is concerned with linear and non- linear semi-groups, structure of single operators, unitary operators, spectral and ergodic theory. Chapter Il on Topics in Functional Analysis inc1udes papers on Riesz spaces, boundedness theorems, generalized limits, and distributions. Chapter III, entitled Approximation in Abstract Spaces , ranges from characterizations of c1asses of functions in approximation theory to approximation-theoretical topics connected with extensions to Banach (or more general) spaces. Chapter IV contains papers on harmonic analysis in connection with approximation and, finally, Chapter V is devoted to approximation by splines, algebraic polynomials, rational functions, and to Pade approximation. A large part of the general editorial work connected with these proceedings was competently handled by Miss F. Feber, while G.